Well, my long winded intro for this post was spun-off into its own entry, Yes, you should have an opinion on the upcoming lockout, so go read that post then come back here for a surprisingly healthy Football Foodie post about brussel sprouts. So assuming you went back and read that particular post, understand that being an informed consumer is just like having healthy snacks. It’s not that hard and frankly, you’re going to enjoy it more than you think you’re going to. Like 90% of the population I always said I hated brussel sprouts. 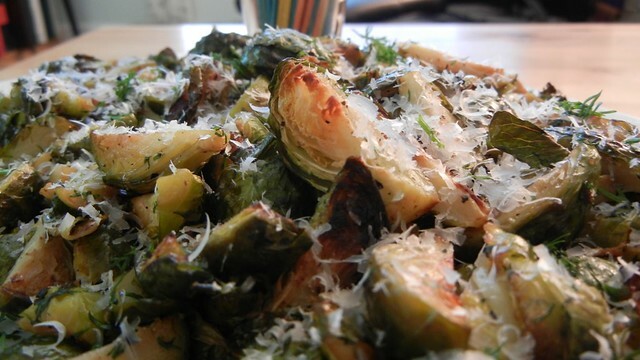 I was wrong and ill-informed about how you can make brussel sprouts into great snack foods. 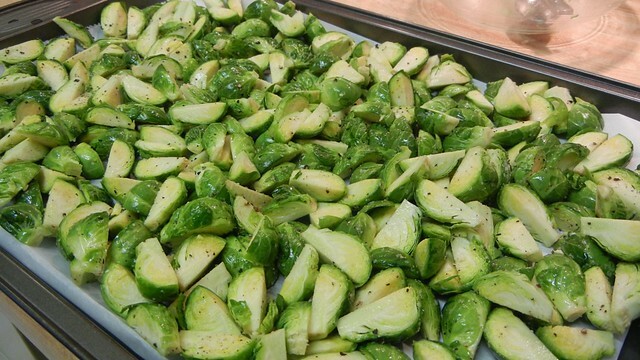 You can take large brussel sprouts and stuff them for appetizers, roast them with pancetta, lightly fry them for brussel sprout “chips”, or as done here, just lightly roast them and serve as a snack. Delicious. You’ll be surprised by how quickly these disappear at a party. 2 pounds of small brussel sprouts. (Save the large ones for stuffing.) Look for the smallest, tightest sprouts you can find. Why so many general measurements? Like most roasted vegetables, it’s all about individual tastes. 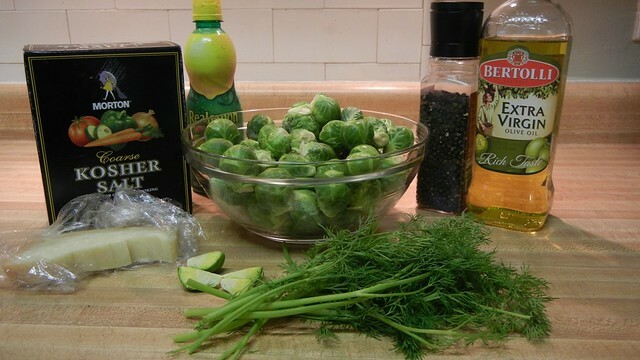 Just make sure all of your sprouts are coated with oil for roasting, use lemon juice to bring out the flavors and season with salt and pepper, but not enough to be overwhelming. 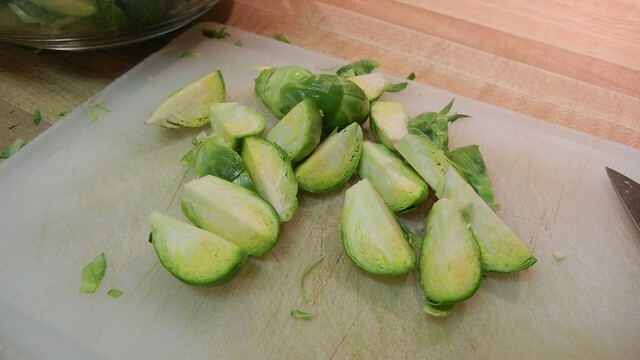 Quarter each brussel sprout, pulling off any lose or yellow leaves as you go. 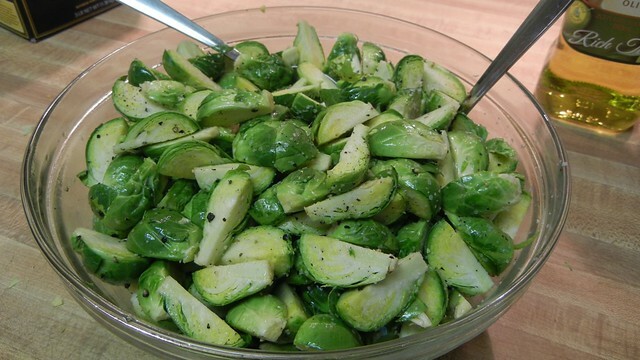 In a large bowl, toss the brussel sprouts with olive oil, lemon juice, salt and pepper. Spread over a lined cookie sheet and roasted in a 400º oven for 45-55 minutes, stirring every 15 minutes or so to get even browning. While the brussel sprouts are in the oven, chop up the dill and remove the stems. This is after about 30 minutes of roasting. See how nice and brown the edges are turning? Crispy, chewy goodness right there. 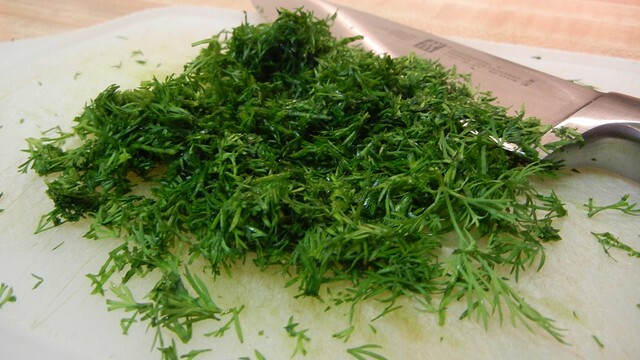 Once done roasting, toss with the dill and sprinkle with more salt if desired. Top with fresh Parmesan if you like, the salt from the cheese pairs nicely with the lemon and the dill, but it’s not necessary. 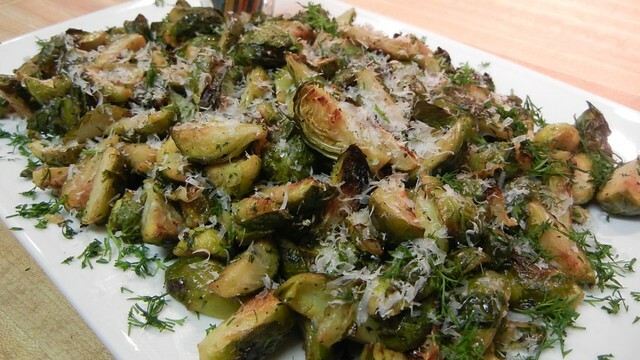 The woody, fresh taste of the brussel sprouts with the sweet taste of the slight amount of caramelization from roasting is outstanding when matched with herbs. Serve either on individual toothpicks or as I lazily did here, on a large platter with toothpicks on the side. Or guests can just scoop them up on to their plate during a tailgate, because roasted dill brussel sprouts taste just as good cold and served like a salad as they do fresh out of the oven, making them one of the more flexible football snacks around. 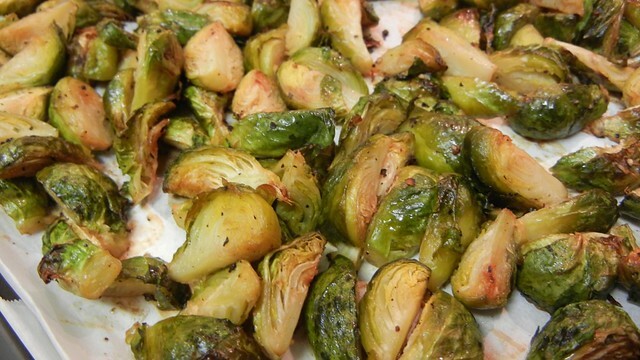 Try these and then tell me you don’t like brussel sprouts.